Karin Fossum’s Inspector Sejer is back in a police procedural-slash-psychological suspense novel that will make you meditate on what makes people tick. The Caller opens with an apparent tragedy. While a baby naps outdoors in her pram, her parents enjoy the peace and quiet and share a lovely meal; the quiet is shattered when the mother goes to scoop up her baby and finds her covered in blood. Much panic ensues before the doctor in the emergency room declares the baby unharmed. Some prankster has simply thrown animal blood on the sleeping child. There’s no apparent purpose, but as Fossum reveals, the devastation is quite real, as the mother, determined to keep her baby safe, can’t sleep or function normally, while the father dreams of revenge. Of course, this taste of power is not enough for the joker, who goes on to set up many more freakish situations throughout the book, while Sejer and colleagues put together the pieces to reveal the perpetrator. Johnny’s nemesis is a 13-year-old girl named Else Meiner, who seems to see through him, although she doesn’t know his secrets. He resents this and tries to diminish her, but unlike his other victims, she emerges essentially unscathed. It is she who is the lone witness to Johnny’s death. The police may never know what happened, for she will never tell. The Caller offers an interesting premise and some strong suspense. The reader may know more than Inspector Sejer, but is not privy to Johnny’s every thought, so there are some real nail-biting moments. And there’s a plot twist that’s heart-twisting for Johnny and the reader both – kind of a reverse O.Henry-esque twist that you probably won’t see coming. 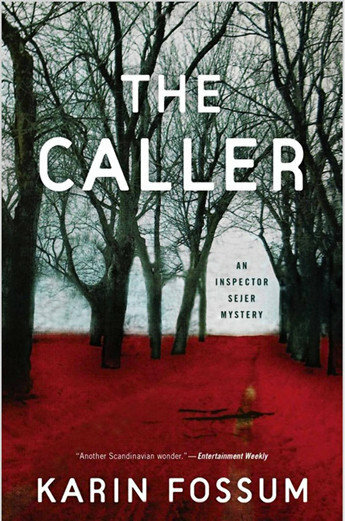 This entry was posted in Commentary, Review and tagged Inspector Sejer, Karin Fossum, Review, Scandinavian mystery, The Caller. Bookmark the permalink.